Hello, and welcome back to our blog here at Comfort Solutions Heating and Air. This is part two of our blog series about HVAC air filters. Last time, we talked about what they are, how they help your home and the different levels of MERV ratings. This time, we’ll take a look at filter sizes, the process of changing your filter, and the frequency that you should change it. MERV rating isn’t the only thing you’ll have to worry about when choosing your air filter. Choosing the right size is also important. Using an air filter that doesn’t fit correctly could result in a leak or the air filter not removing contaminants properly. Start by sliding your old filter out of the filter cabinet. Look on the frame of the filter where it will give you the dimensions, usually shown as length x width x height. If you can’t find the dimensions you can either look up the model number online or speak with an HVAC specialist. Once you’re ready to replace your filter, you can purchase one at your local hardware store or online. Typically, you can set up recurring shipments so that you will always have a filter at your doorstep once it’s time to replace. 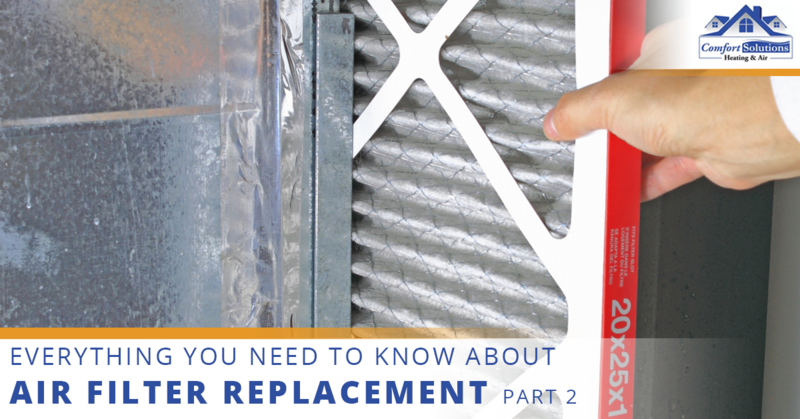 Although you can certainly contact an HVAC specialist to replace your filter, most homeowners will replace their own filters once they know how to do it. It’s best to ask your HVAC technician to show you how to do it when they’re at your home for a regular maintenance inspection. The great news is, it’s simple! Start by finding the filter compartment. This can be found in between the air duct and the air handler. Take off the compartment door and slide the old filter out. Slide in the new filter according to the arrows on the filter that indicate the direction of airflow. Finally, put the air filter door back on, and you’re done! Generally, you’ll want to check your air filter every month to ensure it’s not leaking. If you have a one or two-inch filter, you’ll have to replace your filter every month to three months. Three and four-inch filters should be changed every six to nine months. Five and six-inch filters should be replaced every nine to twelves months. However, if you have pets, a large family or you run your HVAC system frequently, they may need to be replaced sooner. 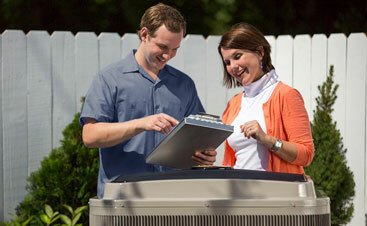 Speak with your HVAC specialist to learn more. Would you like to speak with a certified HVAC specialist in Lawton, Oklahoma City, or the surrounding area? 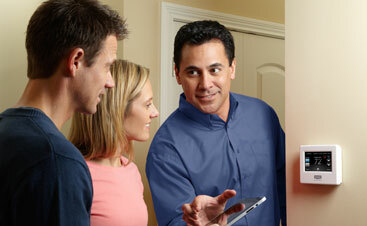 Comfort Solutions Heating and Air is here for you. Are you struggling to decide what air filter you need or you just need annual maintenance or repairs? We’re confident we can provide you with exactly what you need. Contact us today to learn more.